I started working on new nav paradigms for the site. Many thanks to the folks that have already participated in the card sort I put up last week. I got some great feedback and we’ll be updating the nav someday soon. I’m running my first usability test this week and will be doing more soon, I hope. If you are interested in participating (remotely or otherwise), please get in touch – Leave a comment, tweet, forum post, door-knock, whatever. We really have some exciting stuff we need help testing to get right for our users, and your help would be awesome. 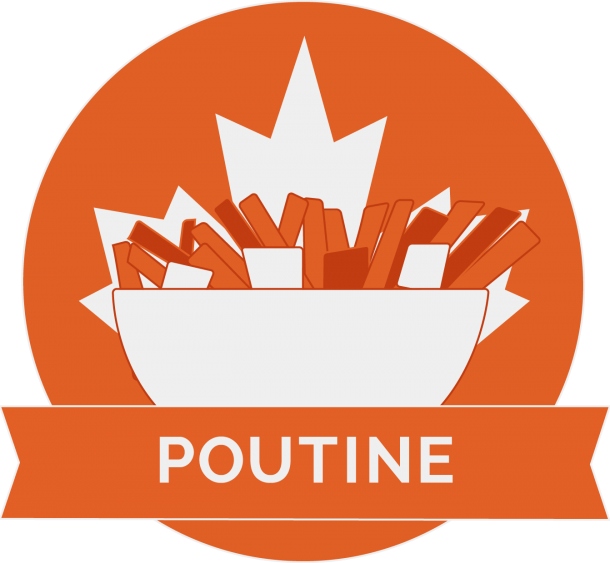 We launched poutine! I also made a poutine badge, which I like very much. You can’t imagine the amount of time it took me to get the fries to look right. Shout-out to Emmett for some refinement help. The poutine course is pretty great. It’s using the same course structure we established with Spherification and we’re hoping to use this same structure for courses going forward. Our aim on these course pages is to be able to encapsulate the recipes and science with more structure and narrative, so you can get through and be linked to the forum easily from any page to ask questions. I’ve made the fries twice now, and if anyone is considering doing it, just do it already. It may seem like a lot of work, but it’s not really, the hardest part for me is finding enough counter space to lay out all the fries after the water bath. I don’t have an immersion circulator, so just used a pot and a thermometer. I performed the brine test, which was fun, and substituted light corn syrup in lieu of Glucose Syrup, which has a little vanilla in it that maybe I could taste a little bit, but also probably just in my head as well (my palate ain’t that good). More good stuff: You can favorite/like any recipe or technique we have on the site now, and you’ll be able to have those show up in your profile for safe-keeping. Use it to keep track of recipes that you want to cook later or have cooked and would like to cook over and over again. The last big thing I’d like to mention, is that we’ve enabled uploads for all recipes! I uploaded the fish & chips I made a while back, and if I hadn’t fallen completely flat on the pomme rösti I tried to make yesterday, would have uploaded that one, too. You guys should really start uploading your pics, it’s a lot of fun. My timeline on my profile is getting kind of ridiculous. We’re working on it. Cheers! Have a great week.